While the animus between Canelo Alvarez and Gennady Golovkin remains constant, at least one issue between them has been resolved prior to Saturday night’s showdown. Canelo’s choice of boxing glove. Boxingscene.com reports that both camps met on Wednesday night to resolve glove selection issue and announce their final selections. 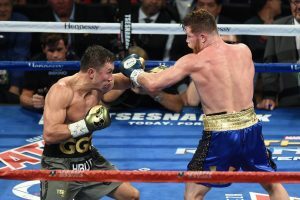 Gloves became a point of contention for Golovkin’s team when they were informed that Canelo intended to wear gloves, a style designed by his team to include extra padding, that had never been worn in a championship fight. Golovkin’s trainer Abel Sanchez told ESPN Deportes he feared the gloves could break, giving Canelo extra time to recover. “Notice that they were gloves that had never been used in a championship fight,” Sanchez said to ESPN Deportes about Canelo’s new gloves that he wanted to wear.” We did not feel it was fair to use them because they had not been tested. We do not know if they are going to break. Imagine that they break in the third round and then Canelo takes advantage to recover or take a break,” Sanchez said. Alvarez will instead wear the style he wore in their initially match, the Japanese brand, Winning. Golovkin will once again wear the same model Grant brand gloves he wore previously. A glove Canelo’s team has no objection to. Gomez goes on to say he hopes there aren’t any other major issues ahead of Saturday. The gloves resolution eliminates one of numerous points of contention between the camps which include gloves, hand-wraps, lack of co-promotional events and zero face-offs. Sanchez recently made headlines when he said Canelo’s stacking method of wrapping his hand was illegal. That claim was later refuted by the Nevada State Athletic Commission. Those of us who write about boxing are told over and over again that the sport we pen articles on is dead. “Too bad you didn’t do this fifteen years ago,” someone once told me. I explain to such people that boxing is quite healthy in many places around the world. Indeed, it actually seems to perhaps be growing in some locations. What’s more, I explain that things are even looking up for the sport here in the states lately. My words, however, fall on deaf ears. Boxing is dead. The sport isn’t what it used to be. Mixed martial arts is king. And that’s all there is to it. Never mind the fact that the famed Wembley Stadium gets completely sold out for boxing matches. Never mind that a recent televised boxing broadcast beat both the NHL and the NBA in the weekend ratings. Minds are slow things to change. 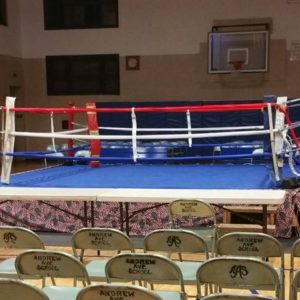 Still, some of those who would write off boxing might want to check out places like the YMCA in Naugatuck, Connecticut, where it’s clear that the sport is alive and well. For this past Saturday, the 65th Annual Joe Triano/Joe Rossi Golden Gloves Boxing Tournament was held within its gym. “They’ve had a pretty strong history in the last couple of years,” Sports and Recreation Director Catherine Proto tells me. This year, the Naugatuck YMCA saw forty-seven Golden Glove participants. According to Proto, about 200 hundred people were expected to show up to view the weekend’ proceedings. “The kids,” she says, “really enjoy the activity, self-discipline and comradery within the group.” Boxing has been an active part of this establishment for well over a half century now, going back to the time of the “Two Joes,” Joe Triano and Joe Rossi, two legendary local boxing figures who knew how to implement a good thing. The program is now run by David Cassetti, the mayor of nearby Ansonia, and a man with a ring history of his own. Can the next Floyd Mayweather be found among the new crop of boxers in Naugatuck? “They probably think it themselves,” says Proto with a laugh.